During the spring 2015 semester, the Women’s Center at UMBC and Women of Color Coalition were awarded a $5,000 grant from the American Association of University Women (AAUW). The 2014–15 AAUW Campus Action Project (CAP) grants, sponsored by Pantene’s Shine Strong campaign, fund student led projects that fight stereotypes and biases. In addition to the AAUW CAP grant, we were also awarded a $500 community project grant from BreakingGround to help support this ambitious campaign. 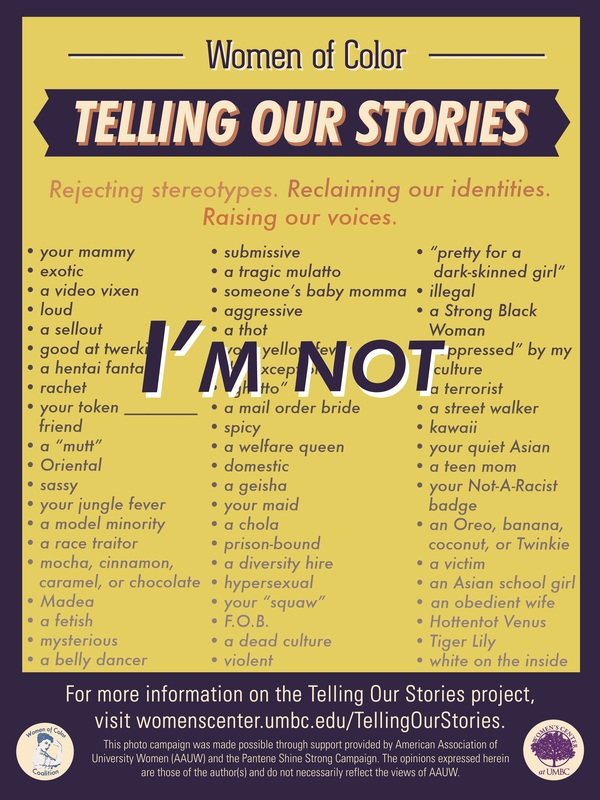 Our project, called “Telling Our Stories: I’m Not/I Am,” aims to 1) raise awareness and reject stereotypes about women of color, and 2) create space for women of color voices and counternarratives. Following a series of consciousness-raising discussions over the past year, many of our students saw the need to promote visibility and community-building among WoC in order to stand in solidarity against racist and sexist microaggressions. By launching the project with the “I’m Not” poster campaign, we hoped to disrupt the misguided assumption that racialized gender stereotyping is not a problem for our campus community. Click here to see all the posters from the campaign! The second phase of the project consisted of a series of creative skill-building workshops culminating in the “Telling Our Stories: I Am” showcase. We intended to go beyond challenging the misrepresentation of women of color and actually create a platform dedicated to their authentic self-representation. 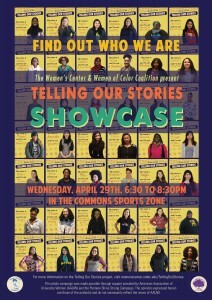 Featuring twenty-five performers from UMBC and the Baltimore community, this event celebrated the creative self-expression of women of color and empowered them to reclaim their own narratives. You can also read about the project at AAUW’s site by clicking here. While Telling Our Stories is currently not an active initiative, we invite all Women of Color at UMBC to participate in the Women of Color Coalition that meets every other week in the Women’s Center during the fall and spring semesters. Email womenscenter@umbc.edu for more details.